I tend to write a lot of drivel about heading into the Alps, there’s no method behind it all, it’s just what floats around in my head. But it seems like a good time to digress and focus on more important topics. I’ve often thought about taking up chocolate science as a career, but much like joining the CIA, it just doesn’t seem to fit me. I’ve also harbored ideas of being a wine connoisseur and knowing how to taste the subtle differences between a pinot and a merlot, but like writing as a career – I’ve generally lacked the desire or drive to get serious about the subject. That’s where the Laughing Lemon comes into play. It sounds like the coolest cocktail you’ve ever heard of, but the Laughing Lemon is actually a cooking school in Zurich. I learned about the Laughing Lemon from Jack (he invited me to the Swiss wine class) who’s dating Kara, who is friends with Kate, who grew up in Ohio, but I met her in Michigan, and then we ended up sailing through Greece with Allison, who’s from Hawaii, and was dating Kevin, who cheated on her, and now I’m dating Iris, who was born in Virginia but grew up in Germany, and went to New York for college where she met Kevin and Evan (who’s wedding I attended in July) the non-sequitur thing is that it’s not the same Evan, and this Kevin is no relation to the one who cheated on Allison. Oh, and the Jack who invited me to the wine course is no relation to Jack McNulty – who runs the Laughing Lemon with Silvia Gautschi McNulty. The point here is that the Laughing Lemon offers a Chocolate and Wine class – which I signed up for without a second thought. I took the class on a fine Thursday night last Fall. We started off learning about the history of chocolate in Switzerland and various facts like: soldiers used to eat high-purity chocolate to stay awake when on guard duty. Then we started tasting an array of chocolates with different cacao contents. Everything from the bitter dark madness to the white too-sweet-to-be-delicious variety. Then came the wine. We learned how to pair different wines to different chocolates. I can’t remember what goes with what, but it’s all written up in the information packet that one is provided with. Truffles are some of the coolest things that I had now idea how to make, and the creation of chocolate mousse has long befuddled my brain. So it was a bit of a godsend that we learned how to do both that night. 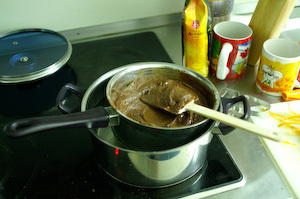 Dipping in melted chocolate, whipping egg whites and gently folding the chocolate in so the mousse has the right texture, we went over all the little things that always intimidated me about chocolate creations in my kitchen. We ended the class with a tasty-amazing-yummy dinner, consisting of rabbit cooked with peppers and dark chocolate used to thicken the sauce. Chefs who do this stuff for a living will tell you that an alternative thickener is blood – I like idea of using chocolate. For dessert we ate the truffles and mousse (goes well with prosecco/champaign), in addition to slices of truffle cake (I think it pairs well with a mild-bodied red wine). All in all the Laughing Lemon cooking school is one of the coolest things to do in Zurich, rivaling a club night at Kaulfleuten, summiting the Glärnish, or even jamming to Karaoke from Hell at Mascotte on Tuesday night. But the test of any class is not what you learn during the lecture, but what you’re inspired to do after you go home. I got inspired to bake a chocolate truffle cake. They’re simple things to make; nothing but chocolate and butter and sugar and eggs. Melt chocolate in a double set-up, it’s not rocket science. However, not having an electric mixer of my own, a chocolate truffle cake is more work than you’d think. 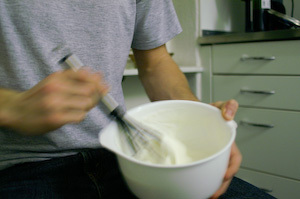 Egg whites just don’t whip up easily (like when Martha does it on TV) when you’re going it all manually with a whisk. In the end, it didn’t look like the one in any cookbook, but I’m not dead yet and still have time to perfect my technique. Oh my god ! You know how to make truffles????? You are definitely testing them out on me next time we are in the same country. And I hear you on the whisk by hand thing. We didn't bring a mixer or food processor to Boston (or even a whisk) and making things like cream cheese frosting definitely results in a workout. I can't even imagine attempting to whisk eggs. It makes me feel a little better about making cookies since you actually have to work for it. Yes, I'm thinking I should get some proper steel bowls and stuff for melting the chocolate, also I need a thermometer and flashy hat. I have a very nice chocolate cooking book, but it's in German, and one day I'll start using it, the truffle cake was one from Martha Stewart. I really like the idea of doing some of this stuff manually, it's like climbing to the top of a mountain instead of taking the cable car. You get to the same place but one is more fulfilling. On the other hand, if you don't have time to spend whisking, and there are many things better than sitting and whisking, the idea of getting a mixer also sounds like a good idea. “the test of any class is not what you learn during the lecture, but what you’re inspired to do after you go home” – Fantastic. The real output of any cooking class rests on what inspiration you get out of it. What a Great Story!